The prohibition has ended. Nine long years of pre-gaming. No more smuggling beer. Starting this season fans will be able to purchase 12 once beer from the Bleacher Cafe. No vendors will sell beer the fans need to be able to make their way over. Beer and Baseball go hand in hand. This means more fights, more profanity, more fun. Tonight Nate and I are going to the game are going to be sitting among the Bleacher Creatures. That's right, we are headed to section 39 for tonight's game. I have not sat in the Bleachers before and I am very excited for the roll call. If you are a little cloudy of your bleacher creature history then check out the wikipeida. Bleacher Creatures: The Bleacher Creatures are a group of fans of the New York Yankees, who occupy sections 39 and 37 of Yankee Stadium's right-field bleachers. A prominent aspect of the Bleacher Creatures atmosphere is their use of a number of chants and songs, the most famous one being the Roll Call, which is done at the beginning of every game. 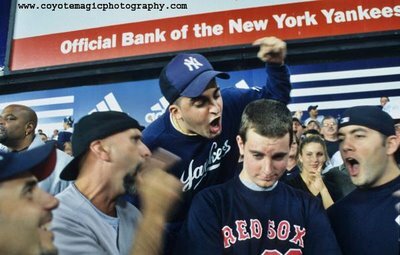 Often, the opposing team's right fielder, who stands right in front of the Creatures, is a victim of jeers and insults.